On Sarah Whitfield’s seventy-fifth birthday, memories take her back to New York in the 1930s. To a marriage that ends after a year, leaving Sarah shattered. A trip to Europe with her parents does little to raise her spirits, until she meets William, Duke of Whitfield. In time, despite her qualms, William insists on giving up his distant right to the British throne to make Sarah his dutchess and his wife. On their honeymoon, the newlyweds buy an old French chateau, but not long after, the war begins. William joins the allied forces, leaving Sarah, their first child, an infant, and their second child on the way, in France. After the Nazi forces take over the chateau, Sarah continues to survive the terror and deprivation of the Occupation, unwavering in her belief that her missing-in-action husband is still alive. After the war, as a gesture of goodwill, the Whitfields start buying jewels offered for sale by impoverished war survivors. With Sarah’s style and keen eye, the collection becomes the prestigious Whitfield’s jewelry store in Paris. Eventually, their jewelry business expands to London and Rome, as their family grows. Phillip, their firstborn, is stubborn and proud; Julian, their second son, is charming and generous and warm; Isabelle is rebellious and willful; and Xavier, unusual and untamed, is the final unexpected gift of their love. They each find their own way, but will be drawn to the great house of gems their parents built. 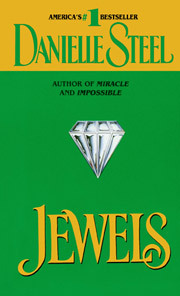 In Jewels, Danielle Steel takes the reader through five eventful decades that include war, passion, international intrigue, and the strength of family through it all.